Displacement of local residents, business, and culture has emerged as an increasingly common challenge among the regions in the Strong, Prosperous, and Resilient Communities Challenge. In late 2018, representatives from the six SPARCC sites and the SPARCC national team came together to elevate the crisis of displacement, to explore the drivers of displacement, and to better understand how health and climate disparities affect housing security. Displacement is often caused by extremes: surging rent costs from new investments, neglect from public and private investments, or climate catastrophes — all of which can force residents to leave long-cherished neighborhoods. We identified several useful resources to help communities mitigate and avoid displacement, and we are supporting new research by the Urban Displacement Project at the University of California – Berkeley to better understand the contributing factors and map displacement-related changes in communities. A key takeaway from that convening is the need to build stronger public will to advance inclusive and equitable development. Communities are already innovating and taking bold action to enact tenant protections, invest in more inclusive community engagement processes, and pilot new land ownership models such as community land trusts, accessory dwelling units, and rethinking health and climate investments to elevate benefits for existing residents. The Southeast Asian Community Alliance (SEACA) is working with public sector and other non-profit partners in the region to promote proactive strategies to address displacement in the wake of 2016’s Measure A, which provided much-needed funding to build, maintain, and improve local parks, beaches, and open spaces. SEACA wants to make sure these funds support Park Equity and don’t displace low-income residents. The Oakland Community Land Trust (OakCLT) focuses on communtiy involvement and empowerment to preserve, restore, and reclaim economic opportunity for low-income residents. OakCLT supports the development of open space, agricultural, commercial, and retail facilities that stabilize neighborhoods. Community interests are represented on the Land Trust’s board of directors, of whom one-third live in low-income communities and another third live in neighborhoods served by the land trust. The West Denver Renaissance Collaborative is piloting a new approach to Accessory Dwelling Units (ADUs) to target the threat of involuntary displacement. The WDSF+ Initiative provides funding and other services to homeowners to undertake weatherization, rehabilitation, or refinancing opportunities that allow low-income homeowners to remain in the community while improving health outcomes and energy use. Qualified homeowners receive support to build an ADU for family members or neighborhood residents. Centers on racial inclusion and deciphering the power dynamics of who benefits, who pays, and who decides. Involves multiple tools and strategies that cut across capital, community engagement, local leadership development, data analysis, and policy change. Elevates integrated approaches that result in better racial, health, and climate outcomes rather than just a focus on the fiscal bottom line or financial return on investment. Inherently recognizes that all of these systems are interconnected and that, to truly achieve systems change, cross-sector approaches are necessary. Looking ahead to 2019, we hope you will join SPARCC as we deploy new strategies within our six sites to demonstrate the power of Inclusive Investment. 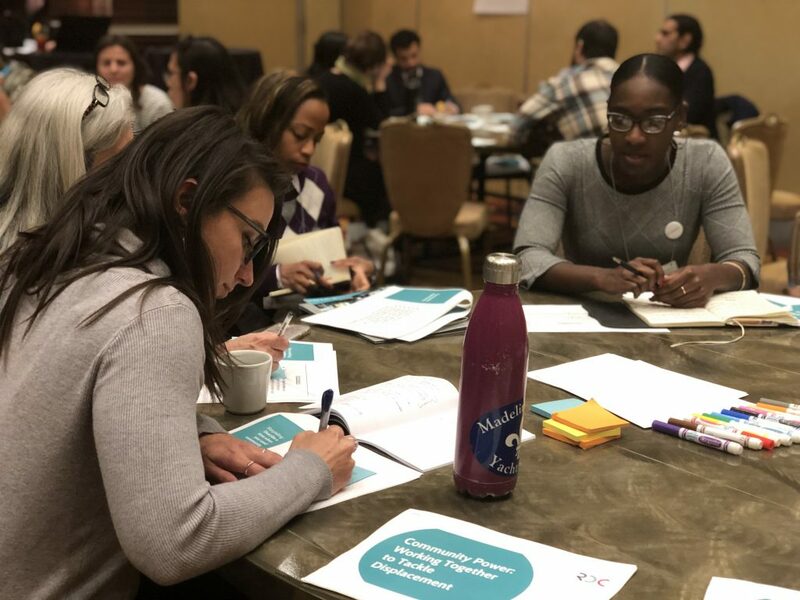 We are committed to building a community of practice in the SPARCC sites of Atlanta, Memphis, Denver, Los Angeles, Chicago and the Bay Area, and beyond. Check back with us to learn about new resources, emerging best practices, and messaging strategies to build public and political will for Inclusive Investment.